As the new Dune film starts shooting, let's take a look at the series' wobbly past on PC. Dune is coming back. Filming is right now underway for Denis Villeneuve's film and Funcom has the license to produce three new games set in the Dune universe. Dare we hope that they will be good? Dune has endured some rocky interpretations and there's a sense, from the aborted Jodorowsky film and the Lynch film that eventually emerged, that the source material may be unfilmable. Can it work as a game though? The answer is: sometimes. A fair few games have emerged in the shadow of the 1984 film. A few were good, and massively influential. The others were not. Let's take a tour. This excellent adventure game was gobbled whole by Dune 2's release shortly afterwards. You play as Paul Atreides on a quest to control the Spice and enjoy a spiritual awakening amid the hellish sands of planet Arrakis. The desert world is beautifully rendered with stark background art and likenesses sketched from the Lynch film. It also has some great music and, for the time, spectacular animations that created the impression of 3D movement while riding worms, which you end up using as a sort of bus service once you've unlocked them. It's not perfect. As Richard Cobbett points out in his Dune crapshoot, Leto introduces himself by saying "I am the Duke Leto Atreides, your father", as though his son has popped into existence fully formed in front of him. Bizarre exposition aside, the exaggerated character art and hazy music create an alien atmosphere and a strong sense of exploration. You travel between secret burrows and Fremen hideouts on a world map, which initially creates a sense of the planet's vast expanse. As it fills up you realise there's an intricate culture hiding out there in the sands. Instead of simply repeating imagery associated with Dune, Cryo use the Lynch film as a springboard to and came up with new designs that look great at low resolutions. The devs ditch filigree and decadent palace finery in favour of strong angles and powerful silhouettes. It's one of my favourite portrayals of that universe. The game that helped to define a genre. Real time strategy games would be quite different today if Westwood had chosen to adapt the novel differently, and an RTS is an unusual framework for a story about power and political intrigue. It’s also difficult to capture Dune’s weathered vision of the future from a top-down perspective and just a few pixels per unit to work with. It’s a triumph nonetheless. Clever little thumbnails in build queues give your imagination just enough to work with. Suddenly those little red boxes are powerful Harkonnen battle tanks. A rippling of sandy pixels hints at the presence of a terrifying sandworm. I used to jump with fear when a roaring sandworm popped up to chomp a spice harvester. It had some interesting ideas. It’s understandable that future RTS games wouldn’t require you to sluggishly lay foundations before building structures, but it’s perfect for the punishing desert climes of Arrakis. The desert is always trying to reclaim your buildings, and your bases feel like temporary outposts at best. Worms circle your harvesters and can plague battles, encouraging you to move tanks between patches of safe rock. The campaign was decent too. The Ordos went off-script, but the idea of a faction that could turn the allegiance of enemy units was neat. Inter-mission chats with your house mentor added flavour and set the stage for Command & Conquer to build these into full FMV briefings. Westwood could not replicate the charm of the first game with this remake. It's not a bad game at all, but it failed to stand out in a post C&C and Total Annihilation world. The genre had moved on and this reskin, while far more advanced than the original, lost Dune 2's atmosphere somewhere in translation. It did at least have proper FMV cutscenes between missions. While hammy, a lot of effort clearly went into trying to capture the vibe of each of the great warring houses. Plus if you play as the Atreides you get yelled at by John Rhys-Davis. Oh dear. The developers Cryo Interactive went bust shortly after releasing this take on the Sci Fi Dune TV miniseries. It’s a third-person shooter with stealth elements and environments that look as though they were conceived at the dawn of 3D graphics rather than 2001 (GTA 3 and Max Payne came out in the same year). The game is irredeemably terrible. 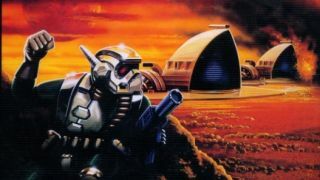 For a universe that has been so vividly realised by Lynch and Jodorowsky's aborted film, a Dune game simply cannot survive looking this way; the shot above is an actual marketing image that they chose to sell their game. Paul Atreides' mother, the powerful Bene Gesserit concubine, looks like she's an egg with a face punched into it. The controls are also terrible and the story makes almost no sense. This is the point where a game adaptation can start to hurt the source material. Seeing two barely animated dolls honk on at one another about Spice and worms makes a venerated piece of science fiction look and sound like trash. This is a problem the books have always had. Though the Lynch film built some enduring imagery, it was itself a broken mess. If you're coming to the series cold it can look ridiculous. 'What's the big deal?' you might think. The book is a 400-page examination of political and spiritual power set in a universe that feels like it has existed for millennia. That universe deserves better. Good luck, Funcom.